Dr. Guy Caldwell, left, and doctoral student Brucker Nourse are studying genetic resiliency to Parkinson’s. Diseases have a spectrum of risk, even those partially embedded in genes such as Parkinson’s disease. Less than 10 percent of those with Parkinson’s can pinpoint their genes as the only culprit, while scores of others with some genetic markers are diagnosed with the disease. Still others have markers to develop Parkinson’s, but do not. Why? 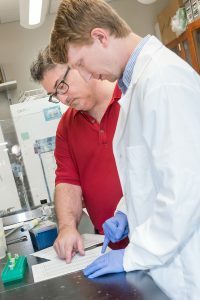 Research underway at The University of Alabama, supported by the National Institutes of Health, hopes to identify factors and methods through which individuals are either resilient or susceptible to the neurodegeneration in the brain as part of the disease. “If we can pinpoint some of the factors that cause this distinction in resilience, then we can use them as a new therapeutic angle,” said Dr. Guy Caldwell, University Distinguished Research Professor in biological sciences. Caldwell, along with doctoral student Brucker Nourse, a native of Nashville, Tennessee, will work with tiny roundworms known as C. elegans, which share roughly half their genes with humans. Its basic features allow inexpensive and rapid testing for a range of neurological diseases, and UA researchers can induce Parkinson’s-like effects in the worm for testing. 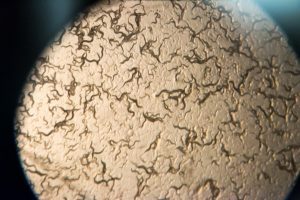 Even though the worms are essentially clones of each other from hermaphroditic reproduction, some animals develop Parkinson’s-related effects while others do not, Caldwell said. Parkinson’s disease, a neurodegenerative disorder, is estimated to afflict between 7 and 10 million people worldwide with approximately 60,000 Americans diagnosed each year. Current therapies include treating the symptoms of the disease such as tremor and involuntary shakes, but there is no cure or treatment to halt the disease’s progression. Hallmarks of Parkinson’s disease are the loss of cells, or neurons, that send information to other parts of the brain, specifically neurons that produce a type of chemical known as dopamine, along with the accumulation, or clumping, of proteins in the neurons. To work, proteins must fold properly within cells. When extra copies or mutations of the protein alpha-synuclein are present in dopamine-producing neurons, a series of misfoldings can occur, leading to aggregation of proteins. Such protein aggregation within the brain’s dopamine-producing neurons can lead to their malfunction or cell death, triggering the symptoms of Parkinson’s. When a Parkinson’s patient begins to exhibit symptoms of the disease, they have likely lost up to 80 percent of the dopamine neurons in their bodies, Caldwell said. Since the worms all have an identical genetic code, Caldwell and Nourse are investigating how the genes of the worm are modified, or expressed. The turning off and on of genes from outside forces is known as epigenetics, and how external factors influence genetic performance is a big part of disease research, Caldwell said. C. elegans, seen here as hundreds living on a plate viewed through the lens of a microscope, share roughly half their genes with humans. The research does not attempt to identify the external influences – after all, a worm has different stresses than a human – rather Caldwell hopes to determine which of the worm’s genes, among those shared with humans, are associated with resilience to dopamine neuron loss. “We’re looking to bring together the unknown environmental causes and the known genetic causes in ways to potentially identify previously unknown protective factors and a previously unknown protective mechanism,” Caldwell said. Previous research published in the journal Science that Caldwell participated in uncovered a protein that regulated dopamine neuron survival. In fact, the research led to the discovery of a small molecule that protected neurons from dying. The molecule worked in several animal models and in human cells in the lab, but was later found not to cross what’s known as the blood-brain barrier in humans, a sort of filter protecting the brain from unneeded materials. In this newly funded research, Caldwell explores an exciting relationship he discovered whereby the same protective protein known to regulate dopamine function might also influence gene expression. The NIH grant of $425,000 supporting the work lasts for three years.